South Central College, North Mankato Campus in Minnesota recently held a Carhartt Grilling for Dollars event, reports Minnesota college president William Kramlinger. He is also his local chapter president. Project summary: Grilling for Dollars was used to raise money for Kids Against Hunger, a national organization that packages dry foods and sends them to impoverished countries around the world. This rice-soy-vegtable mixture is boiled in water and full of protien, fiber, vitamins and minerals that are essential to a child’s development. It took about 20 people to make the fundraiser happen. A representative of Carhartt sent chapter banners, t-shirts and $250 for supplies. The Carharrt vendor, C&S Supply in Mankato, supplied the location and newspaper advertising. The college developed a press release and printed posters. 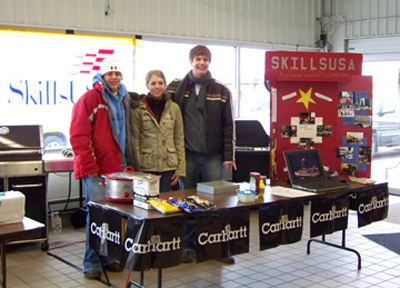 The chapter provided the grill, crockpot and a display about the college and SkillsUSA. The group sold pop, chips and hotdogs, raising a total of $435, which is enough money to feed 1740 children through Kids Against Hunger. Best Tip: During the event they divided volunteers between the grill, money handling, servers, and promoters to talk about SkillsUSA and Kids Against Hunger. The success came from getting media attention. The event was mentioned on radio, in the local newspaper and was also featured on the local news. Not only did the group raise money for their cause, but they also promoted SkillsUSA in the community. When they heard about the fund-raiser, MICO Inc., a local employer that manufactures and distributes hydraulic components and brake systems, donated an additional $3,000 to Kids Against Hunger, which is enough to feed more than 13,000 children. Find out who else is fundraising here .